Ground beetles are a large, cosmopolitan family of beetles, Carabidae, with more than 40,000 species worldwide, around 2,000 of which are found in North America and 2,700 in Europe. It is one of the ten largest animal families, as of 2015. Although their body shapes and coloring vary somewhat, most are shiny black or metallic and have ridged wing covers (elytra). The elytra are fused in some species, particularly large Carabinae, rendering the beetles unable to fly. The genus Mormolyce is known as violin beetles due to their peculiarly shaped elytra. All carabids except the quite primitive flanged bombardier beetles (Paussinae) have a groove on their foreleg tibiae bearing a comb of hairs used for cleaning their antennae. Typical for the ancient beetle suborder Adephaga to which they belong, they have paired pygidial glands in the lower back of the abdomen. These are well developed in ground beetles, and produce noxious or even caustic secretions used to deter would-be predators. 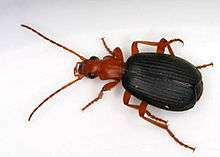 In some, commonly known as bombardier beetles, these secretions are mixed with volatile compounds and ejected by a small combustion, producing a loud popping sound and a cloud of hot and acrid gas which can injure small mammals, such as shrews, and is liable to kill invertebrate predators outright. To humans, getting "bombed" by a bombardier beetle is a decidedly unpleasant experience. This ability has evolved independently twice as it seems – in the flanged bombardier beetles (Paussinae) which are among the most ancient ground beetles, and in the typical bombardier beetles (Brachininae) which are part of a more "modern" lineage. The Anthiini, though, can mechanically squirt their defensive secretions for considerable distances and are able to aim with a startling degree of accuracy; in Afrikaans, they are known as oogpisters ("eye-pissers"). In one of the very few known cases of a vertebrate mimicking an arthropod, juvenile Heliobolus lugubris lizards are colored similar to the aposematic oogpister beetles, and move in a way that makes them look surprisingly similar to the insects at a casual glance. A Cychrus rostratus once squirted into my eye & gave me extreme pain; & I must tell you what happened to me on the banks of the Cam in my early entomological days; under a piece of bark I found two carabi (I forget which) & caught one in each hand, when lo & behold I saw a sacred Panagæus crux major; I could not bear to give up either of my Carabi, & to lose Panagæus was out of the question, so that in despair I gently seized one of the carabi between my teeth, when to my unspeakable disgust & pain the little inconsiderate beast squirted his acid down my throat & I lost both Carabi & Panagæus! Common habitats are under the bark of trees, under logs, or among rocks or sand by the edge of ponds and rivers. Most species are carnivorous and actively hunt for any invertebrate prey they can overpower. Some run swiftly to catch their prey; tiger beetles (Cicindelinae) can sustain speeds of 9 km/h – in relation to their body length they are among the fastest land animals on Earth. Unlike most Carabidae which are nocturnal, the tiger beetles are active diurnal hunters and often brightly coloured; they have large eyes and hunt by sight. Ground beetles of the species Promecognathus laevissimus are specialised predators of the cyanide millipede Harpaphe haydeniana, countering the hydrogen cyanide which makes these millipedes poisonous to most carnivores. 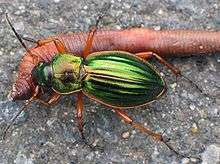 As predators of invertebrates, including many pests, most ground beetles are considered beneficial organisms. The caterpillar hunters (Calosoma) are famous for their habit of devouring prey in quantity, eagerly feeding on tussock moth (Lymantriidae) caterpillars, processionary caterpillars (Thaumetopoeidae) and woolly worms (Arctiidae), which due to their urticating hairs are avoided by most insectivores. Large numbers of the forest caterpillar hunter (C. sycophanta), native to Europe, were shipped to New England for biological control of the gypsy moth (Lymantria dispar) as early as 1905. A few species are nuisance pests. Zabrus is one of the few herbivorous ground beetle genera, and on rare occasions Zabrus tenebrioides, for example, occurs abundantly enough to cause some damage to grain crops. Large species, usually Carabinae, can become a nuisance if present in numbers, particularly during outdoor activities such as camping; they void their defensive secretions when threatened, and their hiding among provisions can despoil food. 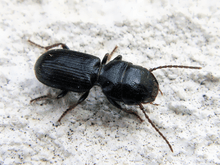 Since ground beetles are generally reluctant or even unable to fly, blocking their potential routes of entry mechanically or with a topical insecticide is usually easy. A crucifix ground beetle (Panagaeus cruxmajor) got Charles Darwin into trouble in 1828. No poet ever felt more delight at seeing his first poem published than I did at seeing in Stephen's Illustrations of British Insects the magic words, "captured by C. Darwin, Esq." The Adephaga are documented since the end of the Permian, about 250 million years ago. Ground beetles evolved in the latter Triassic, having separated from their closest relatives by 200 million years ago. The family diversified throughout the Jurassic, and the more advanced lineages, such as the Harpalinae, underwent a vigorous radiation starting in the Cretaceous. The closest living relatives of the ground beetles are the false ground beetles (Trachypachidae) and the wrinkled bark beetles (Rhysodidae). They are sometimes even included in the Carabidae as subfamilies or as tribes incertae sedis, but more preferably they are united with the ground beetles in the superfamily Caraboidea. Much research has been done on elucidating the phylogeny of the ground beetles and adjusting systematics and taxonomy accordingly. While no completely firm consensus exists, a few points are generally accepted: As it seems, the ground beetles consist of a number of more basal lineages and the extremely diverse Harpalinae which contain over half the described species and into which several formerly independent families had to be subsumed. The taxonomy used here is based on the Catalogue of Palaearctic Coleoptera and the Carabidae of the World Database. Other classifications, while generally agreeing with the division into a basal radiation of more primitive lineages and the more advanced group informally called "Carabidae Conjunctae", differ in details. For example, the system used by the Tree of Life Web Project makes little use of subfamilies, listing most tribes as incertae sedis as to subfamily. Fauna Europaea, though, splits rather than lumps the Harpalinae, restricting them to what in the system used here is the tribe Harpalini. All the approaches mentioned above are legitimate as they agree with the phylogeny as far as it has been resolved. The inclusive Harpalinae presented here are used for two reasons, one scientific and one practical – first, the majority of authors presently use this system, following the Catalogue of Palaearctic Coleoptera. Second, the MediaWiki markup cannot at present adequately represent the relationships of the ground beetle subgroups in detail if the restricted view of the Harpalinae is chosen. Amarotypini – Migadopinae or a distinct subfamily? Gehringiini – Psydrinae, Trechinae or a distinct subfamily? ↑ Usually placed in the Psydrinae or Trechinae, they seem to represent a distinct lineage related to Brachininae and Harpalinae, and in the system used here would consequently be eligible for subfamily status. ↑ "Carabidae Taxa". Carabidae of the World. 2011. Retrieved 24 Jun 2011. ↑ B. Kromp (1999). "Carabid beetles in sustainable agriculture: a review on pest control efficacy, cultivation aspects and enhancement". Agriculture, Ecosystems and Environment. 74 (1–3): 187–228. doi:10.1016/S0167-8809(99)00037-7. ↑ John L. Capinera. Encyclopedia of Entomology. p. 1746. ↑ R. B. Huey & E. R. Pianka (1977). "Natural selection for juvenile lizards mimicking noxious beetles". Science. 195 (4274): 201–203. doi:10.1126/science.831272. PMID 831272. ↑ "Young Naturalist, A Lifelong Passion". Darwin. American Museum of Natural History. 2005. Retrieved February 16, 2011. 1 2 Nora Barlow, ed. (1958). "Cambridge, 1828–1831". The Autobiography of Charles Darwin. pp. 56–71. ↑ Charles Darwin (1846). "Letter to Leonard Jenyns, October 17, 1846". ↑ Shōzō Ōsawa, Zhi-Hui Su & Yūki Inmura (2004). Molecular Phylogeny and Evolution of Carabid Ground Beetles. Springer. ISBN 4-431-00487-4. ↑ "Trees of family Carabidae". Carabidae of the World Database. 2008. Retrieved July 24, 2008. ↑ David R. Maddison (January 1, 1995). "Carabidae Conjunctae". Tree of Life Web Project. Retrieved July 24, 2008. ↑ David R. Maddison (April 11, 2006). "Carabidae. Ground beetles and tiger beetles". Tree of Life Web Project. Retrieved July 24, 2008. ↑ "Harpalinae". Fauna Europaea. 2004. Retrieved February 16, 2011. ↑ David R. Maddison (January 1, 1999). "Amblytelini". Tree of Life Web Project. Retrieved July 24, 2008. E. Csiki (1946). Die Käferfauna des Karpaten-Beckens [The beetle fauna of the Carparthian basin] (in German). Budapest. pp. 71–546. K. Kult (1947). Klíč k určování brouků čeledi Carabidae Československé republiky [Key to the beetles of family Carabidae of the Czech Republic] (in Czech). Prague. C. H. Lindroth (1942). Coleoptera, Carabidae. Svensk Insectenfauna, Vol. 9 (in Swedish). Stockholm. pp. 1–260. Edmund Reitter (1908–1917). Die Käfer des Deutschen Reiches [The beetles of the German Empire] (in German). Stuttgart: K. G. Lutz. Wikimedia Commons has media related to Carabidae.